The Ohio Department of Transportation District Two has announced the State Route 295 bridge in Grand Rapids will be closed for rehabilitation for fifty days beginning June 26, 2017. This closure will affect those visiting Grand Rapids from US Route 24 via State Route 295 from north of the Maumee River. Visitors to Grand Rapids from points east, west and south will have no issues visiting via US Route 6, State Route 65 and State Route 110. While the detour affects mainly those visiting from north of the Maumee River, the Grand Rapids Area Chamber of Commerce has published a map showing alternate detours to get those visiting Grand Rapids into town quickly and safely. The detour map can be accessed on the Chamber’s website, www.visitgrandrapidsohio.com/detour. The shoppes and eateries in the Historic Downtown District will continue to be open regular hours through the closure. Summer events in Downtown Grand Rapids such as Girls Night Out, Rhythm on the River, Weekends to Remember and the Sunset Jazz Arts Festival, as well as programming at Providence Metropark’s Canal Experience, will continue as scheduled. We LOVE a parade – do you? 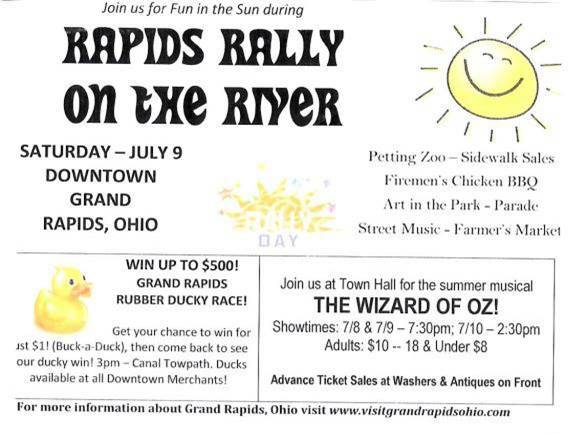 Join us the for the “Best Dam Parade” during Rapids Rally Day on Saturday, July 9! The focus is on the Maumee River and the unique heritage our restored old canal community brings… let’s celebrate! Be creative and use your liberty to participate – a “boat float”, a “root-beer float on a boat”, Life-savers and life jackets…. Make it fun! To enter the parade on Saturday, July 9, just fill out the Parade Registration or email your entry to Joe Schroeder at schrojh@gmail.com. ​Downtown Grand Rapids is a town for all seasons, but there is no better time to visit than now! Keep up with the happenings in your favorite olde canal town. Visit the Events page on our website. Spring Fling is almost here! 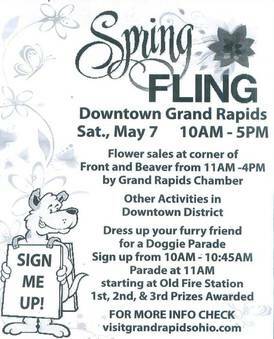 The event is on May 7th from 10 a.m. until 5 p.m. in Downtown Grand Rapids. Sign your dog up for the dress-up "doggie parade" between 10:00 and 10:45 a.m. The parade itself starts at 11:00 from the Old Fire Station and will continue up/down the sidewalks in the business district. Judging follows upon return to the Old Fire Station. 1st, 2nd, and 3rd place prizes will be awarded. Please note that Chamber members are not eligible for prizes. Flower sales are from 11:00 a.m. - 4:00 p.m. at the old hardware store location across from Huntington Bank. Sidewalks sales will be held throughout Downtown. Demonstrations at the Old Fire Station include include yoga, martial arts, and dance. 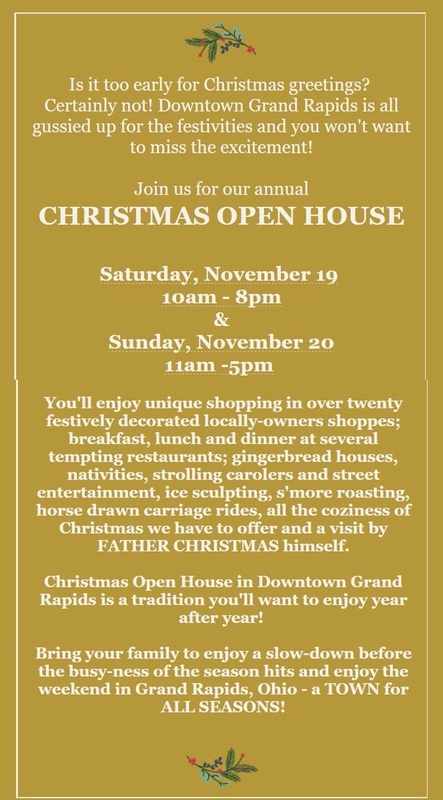 Come join us for a beautiful day in Downtown Grand Rapids! It's spring (or so the calendar says)! 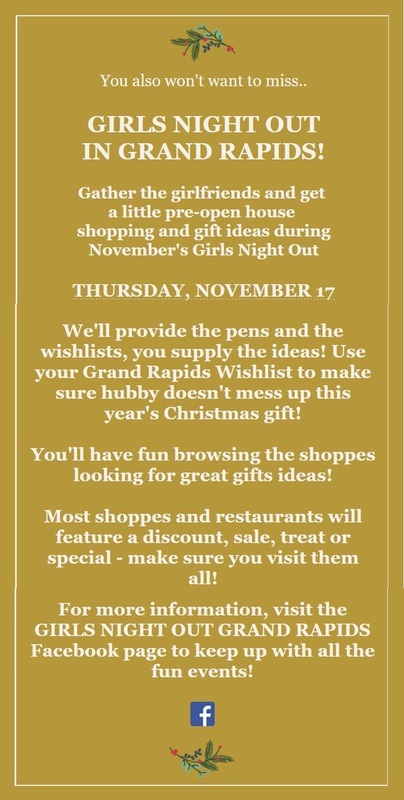 We begin a new season of "Girls Night Out" in Downtown Grand Rapids Ohio, Thursday, April 21 from 5 pm until 8 pm. Call your friends, visit our website to set up your itinerary, and enjoy an evening in the town for all seasons! 2016-04-15 Spring is coming to Downtown Grand Rapids! Download the flyer below for more information about Girls' Night Out (starting April 21), Run to the Rapids (April 16), and Spring Fling (May 7). The Chamber’s Officers are responsible for the day to day operations. Membership meetings are held at 5:30pm on the 2nd Tuesday of each month at the Library House Books and feature delicious snacks, courtesy of the Blue Bakery. · Organize festivals and special events such as “Spring Fling”, “Christmas Open House” and “Light up the Night”. 2016-03-07 Join the Chamber of Commerce! · Organizing festivals and special events such as “Spring Fling”, “Christmas Open House” and “Light up the Night”. We would appreciate your help and support of the Grand Rapids Area Chamber of Commerce. The Grand Rapids Chamber of Commerce is having an ornament contest for two age groups. The first group is for ages up to 12 years and the fee will be one canned good for the Otsego Food Pantry. There will be a first and sec-o nd prize and $15 and $10 Grand Rapids Bucks respectively. The second group is for 13 years and up and the fee will be $5.00 with the winner receiving $25 Grand Rapids Bucks. You can enter as many ornaments as you like as long as you pay the entry fee for each one. All ornaments must be handmade. The entries can be delivered to the Modern Woodman Office (Marsh and Marsh building) between noon to 6PM on November 19. The winners will be determined by anyone who wishes to vote. The ornaments will be displayed in the windows in the store front nestled between Yesterday, Today and Tomorrow and The Garden Gate.. The Chamber will have a ballot box set out everyday from 10 to 5 so you can vote for your favorite ornament. Voting will start on November 21 and end December 11. Winners will be announced at the Lite Up. 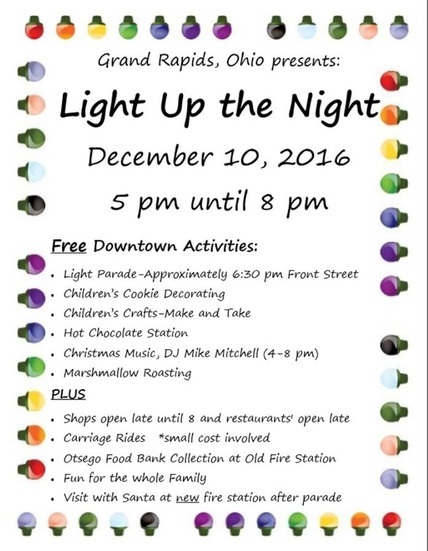 The Grand Rapids Chamber of Commerce is having the 3rd annual Lite Up the Nite. It will be December 12 with snow date December 13. This event is from 5 to 9 PM. This is an event that is geared to the community as a way for the Chamber of Commerce to thank you for your support. We will be collecting food for the Otsego Food Pantry at the Old Fire House. At the Old Fire House from 5 to 7 we will have a children’s make it/take it, cookie decorating and a hot chocolate bar. The participating stores will be open for your pleasure until 9 PM. At 7PM the lighted parade will start. After the parade you can stroll up to the Grand Rapids Fire House to see Santa. Due to bad weather this will be the second annual Lite Up the Nite parade. Anyone and everyone is invited to participate. All we ask is whatever you put in the parade be decorated with Christmas lights (wagons, trucks, tractors, bikes, trikes, dogs, cats, and/or self.) Please take registration form to Mary’s Apple Orchard by December 11. The parade will begin on Bridge Street near the library with the final destination at the Grand Rapids Fire House on Wapakoneta Road where Santa Claus will be there to greet all good boys and girls. The line up for the parade is at 6:30. The Committee for the Light up the Night which is December 12 (snow date 13) has information they would like to share already. The parade was so much fun last year they are planning another one this year. They had a few kinks in last years but have had a lot of good input to make this one bigger and better. So start thinking about what you would like to put in the parade. It can be anything as long as it is decorated with lights. And since you have your imagination working on the holiday season create a decoration/ornament to enter in a contest. The details are not all worked out but more information will be in the November/December issue. Enough about Christmas but thank you for taking the time to read this.